Got bored kids? Unbelievable, right? I don’t remember being bored as a kid and that’s probably because I spent my childhood doing many of the fabulous, creative, imagination and soul/brain/heart/body fulfilling things in this book. Admittedly, most of them were less high-tech versions! but they were creative nonetheless. I’m not saying I wouldn’t have loved the opportunity to make green screen short films from an iPad or travel the world on my PC, but we still can’t underestimate the benefits and sheer enjoyment of free play. Although many of these ideas do incorporate technology (how could they not?) the projects still give kids free licence to use their brains in a way they may not usually enjoy. 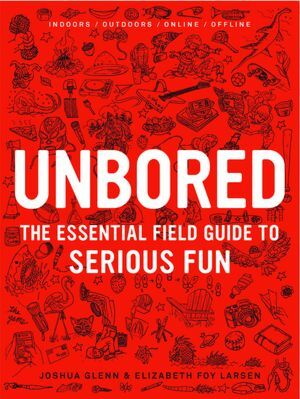 In Unbored, authors Joshua Glenn and Elizabeth Foy Larsen open their impressive tome with a quote by Mark Frauenfelder – Use the world, or the world will use you. Indeed, kids are quickly encouraged to get busy with it – in a series of wonderful ideas, broken down into four chapters – You, Home, Society and Adventure. In You, kids can indulge in such delights as making LED graffiti and geyser rockets. They can train the adult in their life to be a ninja. They can partake in freaky fitness or farting games. In Home, they can live in a tree or learn about architectural styles and details. They can learn how to short sheet a bed or decoupage a skateboard. In Society, they can eliminate bullying, learn some cool counting-out games, read up on banned books they really must read, and how to tell politicians what they think. In Adventure, readers will love learning about Cryptozoology (don’t ask), garden science, geocaching and how to disguise themselves. This is a treasure trove of a book, spattered with fascinating insight and information that will readily sate the natural curiosity of kids. And the best thing of all is that adults will love learning from and partaking in these super cool ideas, too. Well, other than the farting games. Maybe? Philanthropic, creative, smart, interesting – this is a book all kids should own. And use. 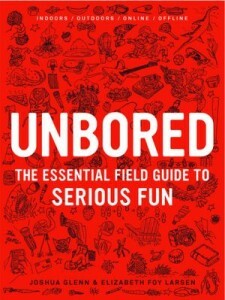 Unbored: The Essential Field Guide to Serious Fun is published by Bloomsbury. Recommended for kids 10+.